← What an EPIC Day! Outdoor Game Fair was a Blast! Need a hunters education card with the fall deer and turkey seasons approaching? Try Kalkomey and their fantastic websites Hunter-Ed.com or Bowhunter-Ed.com. Kalkomey is one of the top providers of online hunter safety education courses. Don’t wait until the season begins – now is the perfect time to take your hunter safety course. So how does this online learning work? You study the material in a fun interactive way. Take the test online. Print your certificate and find a local in-state review lesson. Easy, right? Need more information? When you are in the woods you want to be a safe hunter and education is key. The Kalkomey websites offer features designed to provide high-quality educational experiences that are easy and fun. Guess what – you study for FREE only and only pay WHEN you pass your hunter certification exam. The recent updates to their website include an optional narration feature that allows students to listen, read or both. Hunters Ed exam questions now include illustrations to aid in recall. Remember, in most states you need a hunter education certification to obtain a hunting license. With Kalkomey you pay a one-time fee, which is due only if you pass the test and you can take the test as many times as needed to pass it. You then print out a certificate and visit your state wildlife agency to sign up for a field day. The contents at hunter-ed.com are developed in conjunction with the state agency responsible for hunter education. 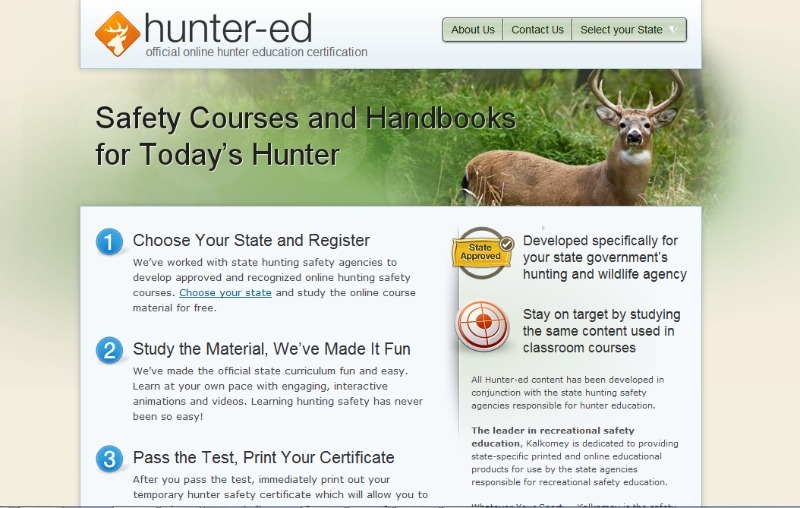 Students who use hunter-ed.com will study the same content used in classroom courses. This online course is offered in more than 30 states, so visit www.hunter-ed.com to find a course customized for your state. Kalkomey makes it easy to be a safe hunter and get your hunting license. In addition to Hunter-Ed.com, Kalkomey offers online instruction in boater, snowmobile, bow hunter and off-road education courses. A gun safety course made easy and fun! Check it out and get on target to get your hunting license for 2011 season! Stay tuned to Carducci Tactical as we get you geared up for the fall hunting season. This entry was posted in Education & Training, Hunting, Product Reviews and tagged be a safe hunter, bow hunter education, Carducci Tactical, gun safety course, hunter safety, hunters ed. bowhunters ed, hunters education, hunters education card, Kalkomey, online hunter education course. Bookmark the permalink.